The field “Project Title” in our Project form is listed as “Deal Title” in the Records view. How do I get it to match? When I try to change it from either view (form or records), it shows the correct value (Project Title) and will not update. First, I wanted to thank you for making the improvement regarding the search function. Hitting “enter” instead of the search button has made things much easier. Thank you. Second, I was curious if another improvement could be made. I notice that the search function is pretty much limited to a cell by cell search of the document. If I wanted to search for all “Florida” cases and within that subset look for all “drugs” cases, as far as I know, this is not currently possible. Is it possible to improve the search function to allow for searching two separate columns for key words? Thank you in advance for any help you might lend me. keep getting message that I can not import data because 2 fields have the same column name. however, each column name is unique. Is it possible to select an entire field/column and update all selected fields with the same new value? e.g. changing field “due data” from 12/31/2012 to 12/31/2015. 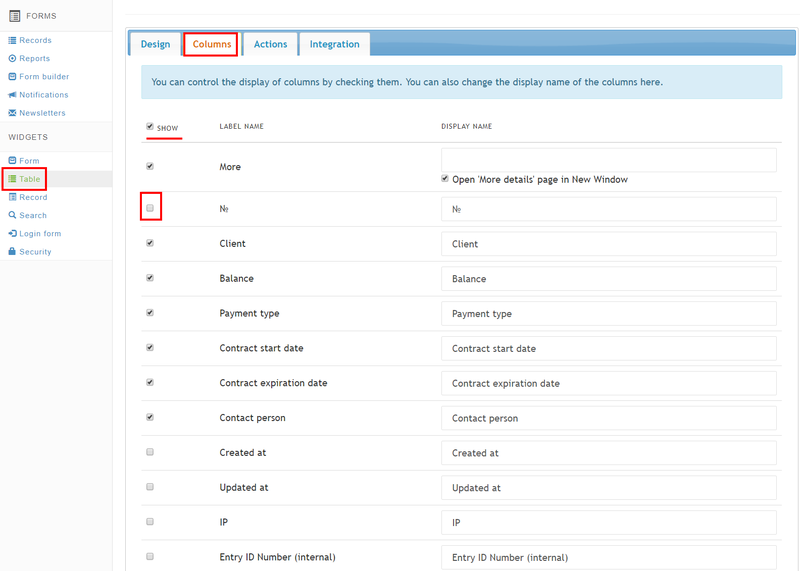 To add an IP column to a table you need to activate this option in the Records menu. Press on “Settings” button. Select IP. Please, see instructions about how to enable system columns here. I have successfully imported 4 databases with no problems. Now I’m trying to build a 5th one, but I keep getting this error msg: “First line should be column names. After import they will represent field names”. I see that at the top of the Records page all the column headings are there. I don’t know if I did anything different this time. I can manually add records, but cannot IMPORT. I erase the project and began over again. The same problem. I have tried importing only one line, or 67 and the same problem. I was also getting an error msg that I had two columns with the same name, but I did not. I was also getting some very strange things imported before this problem. Text that did not come from me. I have one form which has a great number of fields. I am pretty sure when we first started with MTH that I could scroll to the right and see ALL the columns in records. Now I can’t do that anymore. I can only see some of the columns and then it cuts off on the right side in the middle of a column. Can this be fixed please? Thanks! I understand that we can use the CSS line to create columns in our Forms, but this is a bit tricky during development. It would be easier if we could drag them into columns as we can drag their order now. I like the column totals ability, however, I do not like the totals format. I am entering only integers into the fields, but the column totals display as decimals. Is there some way to be able to choose integer or decimal totals? It would be very useful if we could setup column order to be shown on the records page. Currently the order is determined by the position of the field at the form, but sometimes the information we need to see more often is requested at the middle or end of the form. It would be easy to change the form arrangement but it turns out that most of the time it’s not the best solution because of the form’s logic. For example, if you are interested on due date, then you should be able to set due date’s column at the beginning of the records, but you wouldn’t ask for a due date at the form if you don’t have the general information of the task first. If you need extra information, I’ll be glad to provide it! It is currently not possible to Group or Filter by lookup column. It only shows relational column in Search.